Brain Area May Reveal When We Dream : Shots - Health News When people have dreams, an area near the back of the brain seems to wake up. And specific patterns of brain activity in that area can even reveal what we're dreaming about. Most of us have about five dreams each night, though we're not likely to remember any of them. But a team of researchers has found a pattern of brain activity that seems to reveal not only when the brain is generating a dream but something about the content of that dream. Patterns of brain activity in this region also suggested whether the dream included a face or movement, Siclari and a team of researchers at the University of Wisconsin-Madison report in Nature Neuroscience. 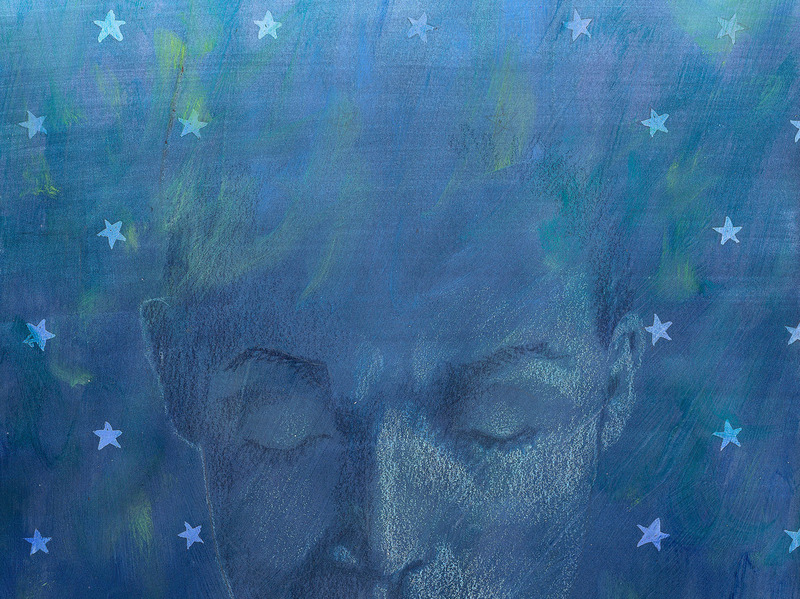 The team found that dreams occurred during both rapid eye movement — REM — and non-REM sleep. But there were also periods of deep sleep in which dreaming did not occur. Participants were awakened frequently and asked to report whether they'd been dreaming. This reduced the problem of people forgetting dreams over the course of a full night's sleep. And sure enough, people in the study were able to recall not only whether they had been dreaming but often what they had been dreaming about. Dreams included riding a bicycle, seeing geometric shapes in motion and smelling perfume. After a person reported a dream, the investigators went back and reviewed brain activity patterns recorded with a technique known as high-density electroencephalography. This allowed researchers to connect dreaming with a decrease in low-frequency activity and an increase in high-frequency activity at the back of the brain. For example, when someone's dream included a face, there was activity in a part of the brain used to recognize faces. And when a dream involved a sense of movement, there was activity in an area that is involved in the perception of movement. "We're using our brains the same way when we're dreaming that we use [them] to carry out those same functions when we're awake," says Robert Stickgold, an associate professor of psychiatry at Harvard Medical School, who was not involved in the study. But Stickgold isn't convinced that measuring activity in the back of the brain is a sure way to detect dreaming. Even people who are awakened every half-hour probably don't remember every dream, he says. "What they're really measuring is what's happening before you wake someone up and the person remembers having been dreaming," Stickgold says. And it's possible that forgotten dreams have a different electrical signature in the brain. When we sleep, our brains repeatedly cross the boundary between unconsciousness and dreaming, which researchers consider a form of consciousness, Stickgold says. The question is: "How does the brain shift into a state of activity where we're dreaming, as opposed to having dreamless sleep?" he says. "That's a phenomenal question that we just don't have an answer to," he says.